BSNL Kerala Telecom Circle has started 'E-Auction of Fancy and Vanity Mobile Numbers' from 25-10-2017 to 31-10-2017 through online portal - http://eauction.bsnl.co.in. Mobile Numbers having some specific sequence, often termed as - Vanity / Fancy / Premium Numbers are available for this e-auction. Customers can participate in the bidding of selected premium numbers through web or through SMS (from BSNL GSM Mobile Number only). The registration and participation in the e-auction process is very simple and easy. BSNL is intended to set a platform in order to make these Premium numbers available for the customers who are more fascinated towards Fancy Numbers. As the demand is extremely high these numbers are pooled for auction so that every individual can make out a chance to grab the number of their choice by participating in Auction conducted on this website. As a whole this Website sets a transparent medium which opens a way to explore our valuable services to the public. Who can participate in the e-auction ? BSNL intends to offer e-auction for the allotment of Vanity Numbers in the Corresponding Licensed Service Area (which includes corresponding Telecom Circle customers) to the eligible customers / companies / Similar firms. The vanity Number will be provided to the successful bidder. This vanity number will be in the Corresponding Licensed Service Area (which includes Corresponding Telecom circle) with all facilities as per the plan like SMS, Data, ISD, International roaming as per the published tariff of BSNL. The prospective customers / Companies / firms must be an Indian Registered Company / Citizen of India. Certificate of Incorporation with copy of articles and Memorandum of Association should also be submitted along with the bid for companies / firms. The prospective customers/companies/similar firms should submit latest acknowledged copy of Income Tax returns form. Individual customers should submit the address proof/Identity proof as per the guidelines of BSNL. How to Register in the Online Portal ? 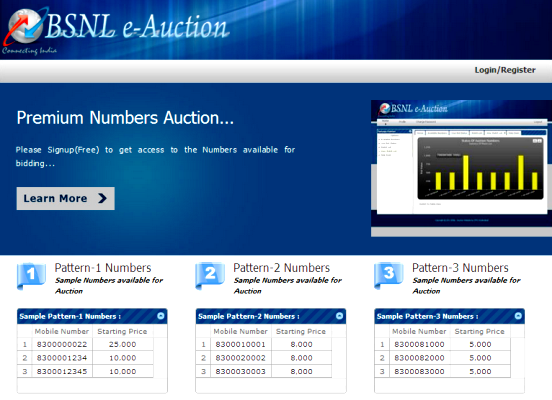 To register, customer has to access the site http://eauction.bsnl.co.in, portal registration is free. The customer can select the number of his choice and proceed for registration of the same by paying non-refundable fee of Rs. 150/ (Rupees One hundred fifty only) which will be charged as registration Fee for each vanity number. The Registration fee will be deducted from the talk balance of Pre-Paid customers and will be included in the next bill of the postpaid customers. How to Participate in the Premium / Fancy Number Auction ? Customers can participate in the bidding of selected premium numbers through web or through SMS (from BSNL GSM Mobile Number only). Send SMS REGVAN for normal Registration to 56666. Normal Registration will be charged @Rs.3/-. To know the VANITY numbers list, Send SMS : VLIST<SPACE><CIRCLE SHORTCODE> <SPACE>< PATTERN> to 56666. Eg: VLIST KL 11111 to 56666. Rs.3/- will be charged for the above SMS. (A) To know the highest bid available for your choice number, send SMS CHOICE<SPACE>10 digit mobile number to 56666. Eg: CHOICE 9495111111 to 56666. Rs.3/- will be charged for the above SMS. Customer can register through “Login / Register” link - login with mobile number & e-mail id - Customer will get Password via SMS & e-mail after successful registration. All payment should be done online. After paying the registration charges, customer can bid for that particular number available in “My Bid Status” menu. The First Highest bidder "H1" will receive a PIN in his mobile number with which he can approach the nearest CSC. The customer has to pay the bid amount and plan charges and can take the connection within 5 working days of receipt of PIN. If the first highest bidder fails to deposit the bid amount within 5 working days of intimation, pin will be sent to second highest bidder(H2) and the number shall be offered to the H2 bidder at the same H1 price. If the Second highest bidder fails to deposit the bid amount within 5 working days of intimation, pin will be sent to third highest bidder(H3) and the number shall be offered to the H3 bidder at the same H1 price. Readers, are you interested in Fancy / Vanity / Premium Numbers? Have you participated in the e-auction process of BSNL? Fancy numbers are necessary for the promotion of business? Please share your views with us.